Gas produced by the methane fermentation of IWW is generally used to supply the plant or installation with energy. This gas can be stored in gas holders that are used to compensate for output variations and to facilitate gas supply to burners. These gas holders often consist of flexible containers enclosed in structures, but flexible double membrane gas holders are increasingly used. The gas holder is composed of two membranes. The inner membrane of the gas holder is composed of a polyester complex coated with PVC: the polyester structure ensures the mechanical resistance and the PVC coating is specially treated in order to ensure the best possible level of sealing, and the best possible chemical resistance to biogas components. The outer membrane is composed of a polyester complex and a PVC coating. 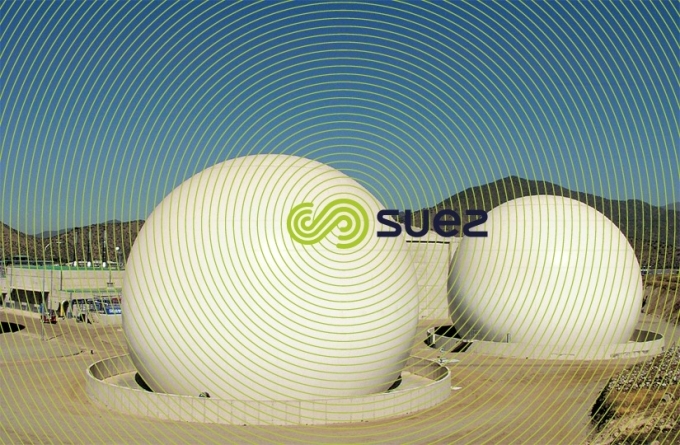 The technology is the same as for the inner membrane of the gas holder but the focus is on the mechanical and external climate resilience capacity as opposed to its gas-sealing capacity. This membrane ensures the mechanical protection of the casing. A waste gas burner completes the facility. If the gas produced constitutes only a small fraction of total fuel consumption, the gas holder could be replaced by a simple gas pressure regulator installed inside the reactor. Photo 2. Flexible gas holders. 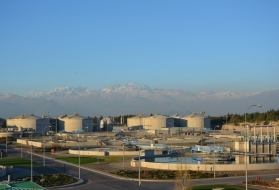 La Farfana (Chile) plant – 3 300 000 p.e.